Carbide Profile|Carbide Factory|Carbide|Carbide Factory|Carbide|Carbide Rod|Carbide Ball|Tungsten Steel Mold-Zhejiang Jingxin Alloy Co., Ltd.
2. It is suitable for the production of unloading plates, stamping die, punch, electronic progressive die and other stamping dies. 3. The material properties of cemented carbide sheets for different purposes are not consistent. 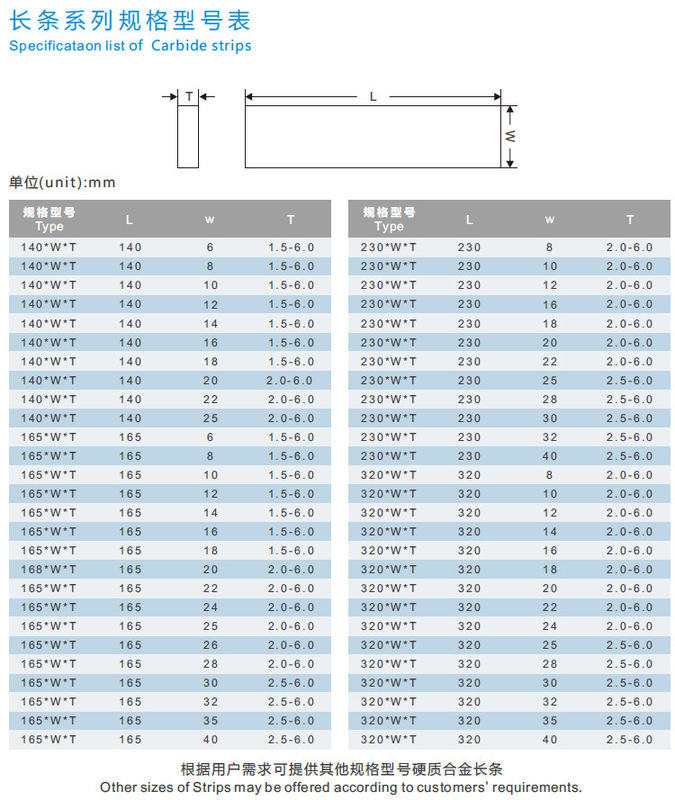 When using, the hard alloy strips of suitable materials should be selected according to the application. 1. The purity of the raw materials is over 99.95%, the impurity content is very small, and the physical properties of the hard alloy strips are more stable. 2. Using spray drying technology, the material is protected by high-purity nitrogen under the condition of full sealing, which effectively reduces the possibility of oxygenation during the preparation of the mixture, the purity is better, and the material is not easy to be dirty. 3. The density of the long strip of cemented carbide is uniform: it is pressed by 300Mpa isostatic press to effectively eliminate the generation of pressing defects, and the density of the long strip of cemented carbide is more uniform. 4. Carbide strips have excellent compactness and excellent strength and hardness indexes. The ship's low-pressure sintering technology enables the internal pores of the hard alloy strip to be effectively eliminated and the quality is more stable. 5. Using cryogenic treatment technology, the internal metallographic structure of the plate is improved, the internal stress can be greatly eliminated, and the cracks of the hard alloy strip during the cutting process are avoided.